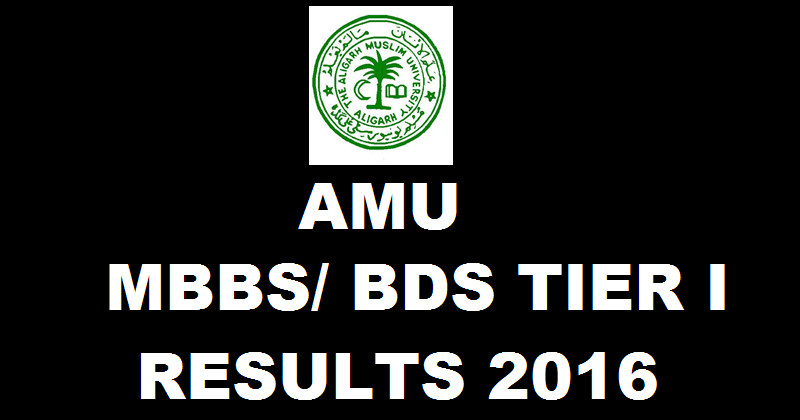 AMU MBBS / BDS Tier 1 Result 2016 declared Check Cut Off Marks @ www.amu.ac.in: Aligarh Muslim University (AMU) conducted MBBS/BDS Tier-I examination on 10th April 2016. Those candidates who had written the exam are waiting for the results. The Aligarh Muslim University declared the result of MBBS/ BDS Tier I examination 2016. Candidates can check the result on the official website of the University or a direct link is provided below for the same. The Tier 2 examination of AMU MBBS/BDS 2016 is scheduled on 1st June 2016. About AMU: Aligarh Muslim University(AMU) is a public university funded by theGovernment of India. It was originally established by Sir Syed Ahmad Khan as Mohammedan Anglo-Oriental College in 1875. The Mohammedan Anglo-Oriental College became Aligarh Muslim University in 1920. The main campus of AMU is located in the city of Aligarh, Uttar Pradesh. The AMU offers more than 300 courses in both traditional and modern branches of education. In addition to it has its three off-campus centres at Malappuram(Kerala), Murshidabad(West Bengal) and Kishanganj(Bihar). The university comprises all castes, creeds, religions and genders, and is an Institute of National Importance provided under Seventh Schedule of the Constitution at its commencement. Check Result of AMU MBBS/BDS Tier 1: AMU declared MBBS/ BDS Tier 1 Results 2016. AMU conducts the MBBS BDS entrance exam in two stages for admission to around 180 medical seats. Out of the total, 145 are MBBS seats in Jawaharlal Nehru Medical College and 35 BDS seats in DR. Ziauddin Ahmad Dental College. Those candidates who had appeared for the Tier-1 exam can check the result on the official website of the University or a direct link is given below for the same. Visit the official website of the University or a direct link is provided below. Click on “Result of AMU MBBS/BDS Tier 1 2016”. Download or check the result of AMU MBBS/BDS Tier 1. For more information, please visit the official website of University regarding examination or result.